Rohingya crisis: "After measles and diphtheria outbreaks, what will be next?" We should not be seeing cases of diphtheria anymore. This highly fatal childhood disease is covered by the basic package of vaccinations, so when it appears it shows there has been a fundamental breakdown in vaccination programmes. In Myanmar, the Rohingya have very limited access to basic healthcare, which is why we are seeing these cases. In the past months, more than 688,000 people have fled Myanmar and are now living in huge, overcrowded camps with inadequate access to shelter, water, food and medical care; conditions which are ripe for the spread of infectious diseases. I arrived at the end of December to work in the diphtheria centre that MSF opened to relieve pressure on other health centres. It’s important that patients with diphtheria are cared for separately, otherwise all other patients in a health facility are at risk of catching the disease. When I arrived, there were about 100 patients in the centre’s orange zone, which is for patients who are not critical, but who need antibiotic treatment to recover. In a setting like this, with a disease that affects many children, patients would often come in with a caretaker. Sometimes parents would also bring other children who were not infected, as there was nobody else to care for their child. Diphtheria can be prevented in close contact by giving antibiotics, so they were given to everyone who came into the centre. When I arrived, the plan was to open the red zone within a week. The red zone cares for more serious patients who need extra treatment to recover. Most patients with diphtheria have a fever, sore throat and difficulty swallowing. For some people it can be very serious; they can have difficulty breathing, their tonsils can become inflamed. Diphtheria forms a thick covering of the throat, which can be dislodged, obstruct the airway and cause swelling of the neck that can compress or block a person’s airways. This often happens to children and can cause them to die. What makes diphtheria a serious infection is that it makes a toxin, basically a poison, which can spread around the body. This can cause complications, including with the heart; making it beat too slow, too fast, or even cause it to stop. "We may have cured them of diphtheria, but we are sending them back to a place where they could be at risk of further outbreaks. There has already been a measles outbreak, what will be next?" It can also cause paralysis, including of the muscles used for breathing, so people suffocate. The second part of the treatment is to give these patients an antitoxin. There can also be complications with this treatment, which is manufactured in horse blood. Because outbreaks of diphtheria are so rare, no pharmaceutical company thinks there will be a market for an antitoxin that has been developed in a laboratory, so it is still manufactured in this antiquated way. However, products made in horse blood have a high rate of allergens in humans – they can cause people to collapse or to go into anaphylactic shock, so patients need access to emergency treatment when it is administered. In South Africa, where I am from, we would give this kind of treatment in an intensive care setting, whereas here we have to make the treatment safe in a field hospital. When you give the treatment you have to monitor people closely and control the rate at which it is administered. Allergic reactions can happen very quickly, so you need one nurse per patient, which means having sufficient numbers of well-trained health workers is incredibly important. Bangladesh has not seen a case of diphtheria for many years, so training was incredibly important to make sure we could work safely. It was wonderful to work with the Bangladeshi staff - due to the sheer number of patients needing treatment, they were frontline. They really took on the challenge of responding to the outbreak. When patients, especially children, receive the antitoxin it is incredible to see them recover – even if just hours before they were lethargic and unresponsive. I really remember children recovering and being able to go home. Or to the place they now know of as home. 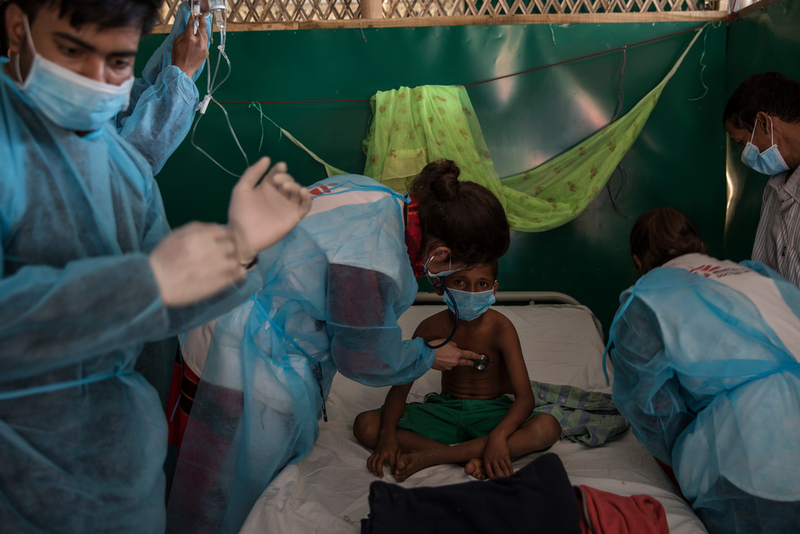 Jamila, aged 10, is examined by a doctor in MSF's clinic in Uchiparang makeshift settlement after showing symptoms of diptheria. But when patients leave the facility, you are aware you are sending them out to a camp that is seriously overcrowded, where there are water and sanitation problems. We may have cured them of diphtheria, but we are sending them back to a place where they could be at risk of further outbreaks. There has already been a measles outbreak, what will be next? The question remains: what is next for these people? There is a great concern that if they move back to Rakhine they could be in danger once again and have little access to assistance. Safe and dignified voluntary repatriation can only be considered when conditions in Rakhine improve for the Rohingya. So there was a feeling that you were making a difference to individuals at that moment of treatment, but the overall picture is far bigger.